1 360 Degree Feedback – What, Why, How? 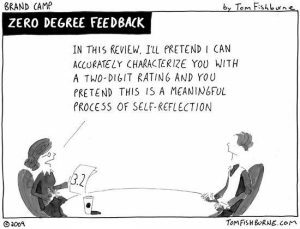 3 A 360 Degree Feedback…Questionnaire? 5 360 Degree Feedback, pros and cons ahoy! 7 360 Degree Feedback Improves Employee Performance, isn’t a Performance Review? 8 How to give 360 feedback to your boss? 12 360 Degree Sample Reporting, Sir! 360 Degree Feedback – What, Why, How? Simply, 360 Degree Feedback is a review process where employees anonymously receive feedback from those who work with them. Known also by multi-rater feedback, multi-source feedback or multi-source assessment, it dates all the way back to WWII when the German military gathered information from multiple sources to evaluate performance. So, it’s definitely not a new age thing !!! The process is quite inclusive in how it gathers feedback from both internal stakeholders (like peers and subordinates) and external stakeholders (like customers and subordinates) as raters along with conventional appraisals. In a nutshell, the feedback gains them valuable insights into how they are professionally perceived by their co-workers and associates. This then becomes an opportunity for them to develop skills and adjust workplace behavior to excel accordingly. Sometimes, 360 Degree Feedback is also used to measure employee performance along with appraisals. A common practice, for sure, but one that is not without its share of associated problems. 360 Degree Feedback shoots for an organic and holistic focus on an individual employee’s behaviors and competencies—more than just job requirements, basic skills, and goal-oriented performance objectives. This may be integrated into a larger employee performance management process, but only after clear research and communication about how it will be implemented. World War II aside, the concept of the 360 Degree Feedback system came into public thinking in the 1950s and 1960s when organizational development became a topic of increasing interest. Organizations understood the need for holistic improvement in an employee’s behavior and development. Initially, efforts were heavily focussed on collecting feedback upward i.e. Managers seeking feedback from reportees that gradually evolved into the bare essentials of the inclusive multi-rater 360 Degree Feedback functions we know today. The process typically engages both internal and external stakeholders, sometimes including the employees themselves, their manager, peers, and customers or even vendors they have interacted with. A number of at least five people (a good number to start out with, although a larger number is recommended for credible sample size) fill out a feedback form, answering relevant questions related to a recipient’s workplace behavior and interactions. Greater participation produces more reliable and neutral feedback visibly free of biases. On completion of the 360 Degree Feedback, a detailed report is presented to the recipients to help understand their strengths and weaknesses and build a development plan. The individual responses are, of course, kept confidential. They’re presented together along with others from the same respondent category(e.g. peers, subordinates, etc.) to preserve anonymity. In this age of automation, online 360 Degree Feedback tools are mostly deployed that have to be customized to the needs of the process they are being used in. Of course, the core piece of the process is a feedback form that has to be built with well-researched questions structured logically equipped to gather effective feedback for the recipient. Primarily concerned with helping employees understand how they can develop and help the organization grow, the 360 Degree Feedback process’ essential use lies in enhancing the bottom line of an enterprise while creating an environment that fosters greater cooperation, collaboration, and success. The benefits to be reaped by implementing a 360 Degree Feedback system in terms of performance increased through transparent communications and greater self-awareness are too immense to ignore, despite its challenges. The most important aspect of the 360 Degree Feedback program planning phase is the design of the questionnaire to get feedback on. What are we measuring – Competencies, Values, Behaviors? For each, what are the list of attributes the employee will be measured on? For each such attribute, what description & pointers should be added to make it easier for the feedback provider to know what to focus on and measure? What are the tools for measurement? Typically a rating scale that can be based on time (always, seldom, often, etc), utility (good, better, worse, etc) or conformity (Fully agree, disagree, etc). Maybe at times, we need to ask questions that require subjective feedback. What are such open-ended questions that are to be asked by the respondent profile? What are the different respondent profiles that will participate in giving feedback i.e. Senior, Junior, Customer etc? Surely, our questionnaire has to be customized based on the role of the employee & the respondent. Has a fair number of questions that aim to capture optimal responses while not causing boredom or disinterest in the respondent. Typically, the size of the questionnaire is approximately10 competencies to rate and 3-5 subjective questions to respond to. Parameters to be rated are added with descriptors in a sentence or two, such that there is no room for confusion for the respondent. A 3 to 5 point rating scale is used, depending on what is being measured. If the rating is on utility, a 3 point rating scale can be quite useful. Again, if the respondent is being asked for agreement or disagreement, a longer rating scale is recommended. Subjective inputs are also requested for each parameter. Since quantitative measurements are open to interpretation, any subjective feedback tagged along to the rating provides context & relevance to the employee. To keep it simple, a standard questionnaire is administered irrespective of employee and respondent profile. This helps in comparing ratings on same parameters received across different respondent profiles. The Questionnaire is the data collection tool & cannot be inadequately designed for the objectives of the exercise. A useful approach is to run a pilot trial on a sample group before the Go-Live of the program. This helps in finetuning the process & identifying gaps that weren’t imagined before. Keep note that a team has been established and running for a certain level of time (almost two years, usually) before introducing the feedback process. Assess factors like team maturity, trust levels, commitment, and stability prior to launch, take stock of the positive or negative implications these might have for feedback. Clear communication about the purpose and benefits of the 360-degree feedback process helps with negating the biases that sometimes creep in. All participating parties need to be coached to give and receive feedback in the best way possible. Help everyone involved understand how important the process is for general development and individual improvement. Mention and stress upon the anonymity associated with it and that the feedback provided are only on the basis of workplace behavior. These decisions on the structure will consider the purposes for which feedback will be used for, along with preparing an action plan to share feedback within the team. This plan helps prevent respondents from cynicism, thus encouraging them to provide feedback in the future. Leaders can also determine beforehand the frequency with which feedback will be collected in the future. A standard recommendation is to conduct feedback in six to twelve-month intervals from the start of the feedback process in which progress and performance improvements will be assessed. Only anonymous 360-degree feedback can lead to any real honesty. Credit: Dilbert by Scott Adams. Agree upon a minimum number of raters beforehand to establish and protect rater anonymity. The usual bar is having at least five raters across respondent groups to complete the feedback process that is shared with the individual. Additionally, ensure that employees and their raters feel the process to be fair and can thus expect to be rated honestly. This is the crucial bit where having a heterogeneous rater pool involving input from both the manager and the employee being reviewed is the go-to approach to ensure the smooth functioning of the 360 degree feedback system. Whether it is delivered by a well-versed external consultant, an automated 360-Degree Feedback system or an internal leader, it is critically important that feedback is shared in a way that propels an organization (or a team with it) to better perception and performance levels. Direct training towards helping leaders interpret feedback results, help other members identify strengths and weaknesses, handle and deal with negative feedback. All of this points towards developing action plans for sharing feedback with the team and working towards clear, established goals. 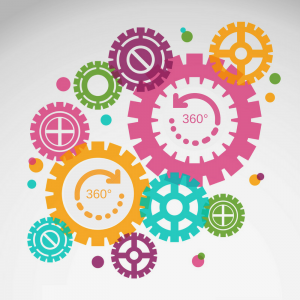 360 Feedback is a tool that provides developmental benefits and opportunities for employees. This relates to their workplace behavior, communication, and other activities. Performance reviews evaluate employee performance based on certain work goals that were set for a given time frame. The two just don’t mix well. 360-Degree Feedback is not a way to measure performance objectives, fulfillment of basic job requirements or focused on any particular technical or job-specific skills. Use it to create a strong company culture that promotes self-awareness and creates transparency in communications through foundations of trust and clarity towards the mutual goals needed to sustain the benefits it brings. 360 Degree Feedback, pros and cons ahoy! 360 Degree Feedback is far too important to ignore. Credit: Pinterest. To reiterate, a 360 Degree Feedback system is not your average Performance Appraisal process and thus its objective is not to merely judge a subject based on a set of work goals. It is above all a developmental tool, and like all tools has its own share of advantages, disadvantages, and ways of benefitting from the former by minimizing the latter. The 360 Degree Feedback process is obviously more accurate, reflective, and validating than a one-to-one supervisor assessment of employee traits and thus more likely to translate into specific developmental actions and better business results. – This reduces discrimination because of race, age or gender. Facilitates open communication about performance because it involves giving and receiving feedback from all directions in the organizational structure —upwards, sideways and downwards. Feedback collected from a relatively larger sample space is found to yield higher quality feedback that is significantly more reliable and viable than those from a lesser number of sources. 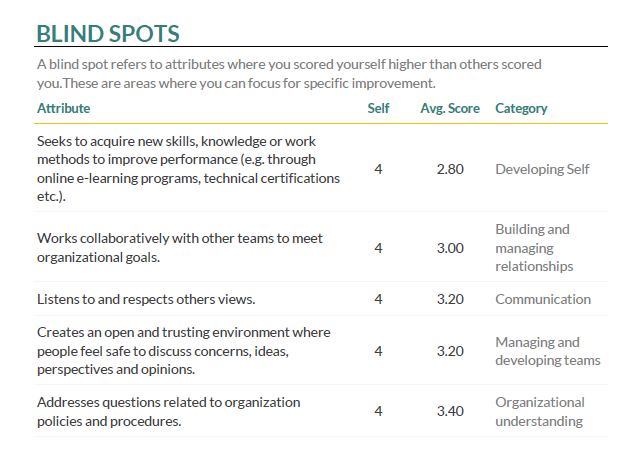 Identifies areas with potential for development both in the personal or professional spheres to help one align better with their career goals and the collective vision of their organization, facilitating improved team dynamics. – Empowers employees to be recognized for their strengths and the impact they have on the organization. – Provides managers with valuable insight into the improvement of services across departments and functions. – To properly allocate investments. – Implement plans for classes, cross-functional responsibilities, and cross-training. The opposite side to this equation shows how an incorrect or hasty implementation of the360-degree feedback can lead to its own share of (although avoidable) disadvantages. Feedback needs to be honest, constructive, multi-source with an adequate number of reviewers and anonymous to be effective. Credit: Dilbert by Scott Adams. Feedback may be incorrectly provided for dishonest reasons or motivated by personal bias, ultimately resulting in the process becoming counterproductive. – Stressful and taken negatively without proper orientation and training on how to understand and receive it as constructive criticism. – Lose its efficacy, provided employees aren’t coached on how to give effective peer feedback to their co-workers and seniors, and vice versa. An inadequate number of reviewers might lead to a skewed or biased review. 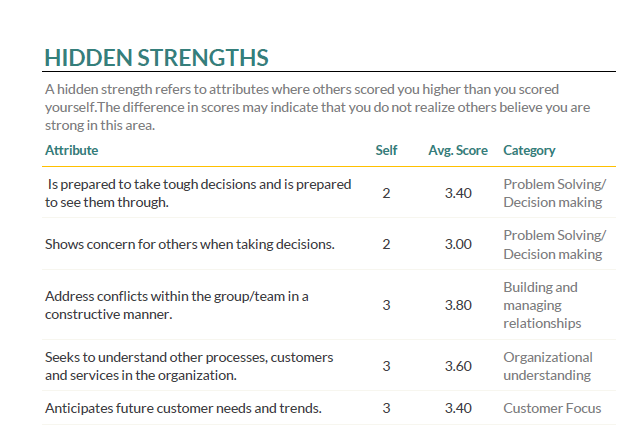 Raters chosen might not be based on their working relationship to the individual and how closely they know the person leading to a loss in insightful actionable feedback. Feedback stands the risk of becoming a mere bureaucratic formality if not executed in an open and methodological fashion. – Become time-consuming and lead to a loss in the effectiveness of the feedback. – Result in people holding back in giving or receiving feedback in a completely honest manner due to fears and a lack of communication. The 360-degree feedback process and its merits, impacts and potential pitfalls thus have to be substantially communicated to everyone involved. All of these can be easily dealt with by reducing anxiety among employees, along with using a neutral third party to administer your feedback program. The system stands a real risk of failing if it is a mere add-on rather than a supporter of an organization’s strategic aims, direction, and requirements. Conventional appraisal systems can seriously affect and be affected by superior-subordinate relationships. Factors like reviews being based on recent performance while employees expect an evaluation of the entire year’s performance also leads to a deep-seated mistrust of traditional annual reviews. Effectively links and reinforces competencies, behaviors, and skills that shape the department or organization’s overarching visions and goals. Reduces job overlap along with inefficient use and wastage of an employee’s particular talents. Maintains an inclusive outlook, preventing workplace discrimination. Makes management more systemic and better equipped to lead with access to in-depth data gathered from both qualitative and quantitative feedback. Increases accountability within the organization, with employees acutely aware of the specific achievable goals that they are expected to meet. Boosts self-awareness to include not only strengths and weaknesses but also insights into particular workplace behavior and interactions. Kickstarts development of new skills and behavior along with building upon already existing strengths. Broadens perspective to include opinions others have on their ways of work. Improves team dynamics and productivity as instances of both formal and informal communication tends to increase after the implementation of a 360-degree feedback process. The process also provides raters with a greater understanding of expected core values and behavior. Allows an individual to uncover blind spots and understand hidden skills or actions they might have overlooked. Positive change in the behavior of peers due to the results of a 360-degree feedback makes employees feel valued and empowered to effect positive change in the workplace. Employees being empowered to provide honestly, upward feedback gives managers and executives, in turn, a fresh perspective on their leadership skills and behavior. The anonymity ensures the feedback is candid and that raters have no fear of retribution. Relatively low initial upward feedback getters usually tend to receive better ratings with time and effort. 360-degree feedback directed at leaders and managers reflects well on management as one that cares about the opinions and satisfaction of its employees. 360-Degree Feedback fosters an open and trustworthy work environment for everyone working together, committed to complete honesty and helping each other gain a better understanding of their performance and actions. 360 Degree Feedback Improves Employee Performance, isn’t a Performance Review? Feedback is about growth not just crunching numbers. Credit: Brand Camp by Tom Fishburn. The 360-degree feedback process is among the most practical of solutions that can help you get the best from your team and help them grow. It allows in inputs and perspectives that manager appraisals alone may not be able to provide. The 360-degree feedback process isn’t limited to any particular hierarchical level. From interns to employees, to upper-level executives—it can assess and collect multisource feedback on employees on every rung of the ladder for a variety of developmental reasons, all beneficial. When implemented with due thought and planning, it can prove to become a powerful tool for open, transparent, and anonymous developmental assessments across departments and corporate hierarchies. Its team-building aspects ensure that you collaborate with peers, reportees, and superiors to recognize and effectively eliminate issues related to workplace behavior, effectively leading to better company culture and retention rates. The multi-rater nuanced nature of 360-degree feedback allows an individual to highlight professional behavior or weaknesses that they don’t notice, despite exhibiting them. They can then work to focus learning and development in those areas. The flipside of this is that hidden competencies, those that you rate yourself low on but those around you don’t, are also brought to light thus informing insights on your skills and work. The feedback culture works both ways. Receiving feedback makes one aware of how they are perceived but giving feedback also creates awareness of how they perceive others’ workplace behaviors and performance, thus making them understand and evaluate their own behavior better. This kind of feedback directly results in increased accountability towards the team or organization as employees’ self-awareness motivates them to take ownership of their performance and professional development. Once individual strengths are discovered and categorized from the results of a 360-degree feedback system, a tailored development and training plan can be created. These will then serve to augment and further improve the targeted competencies for both the employee and the organization’s advantage. 360-degree feedback empowers employees to take an active role in understanding their flaws and finding ways of improving workplace proficiency. It places the means of achieving it squarely in their hands while the multi source nature of the positive feedback received validates their existing strengths and inspires them to be better. Happy, driven, challenged, and focussed individuals are more likely to be motivated and productive and thus form the very crux of an effective organization. Team building and skill determining exercises like the 360-degree feedback process take precious time and effort and are resources expended in the service of an organization and its employees’ goals and interests. The 360 Degree Feedback process builds a secure bedrock of improvements to employee performance from empowering their work ethic and sense of recognition to using insights gathered from the feedback reports to work towards sustainable goals, thus strengthening institutional bonds and leading to better customer satisfaction! How to give 360 feedback to your boss? Make your feedback honest *and* constructive. 360-Degree Feedback guarantees the anonymity you need. Credit: Dilbert by Scott Adams. Recognizing and acknowledging each other’s achievements goes a long way towards creating strong feelings of acceptance and solidarity. This is true beyond the confines of any workplace. Despite popular misconceptions, all individuals and stakeholders associated with the working and well-being of an organization can be the subject of a 360-degree feedback. Managers. Upper-level managers. Executives. Your boss. Even CEOs. Everyone. A 360-degree feedback process is a strategic tool that can help locate issues and drive development for anyone functioning in a shared workspace. As with your other co-workers, your managers and bosses too are hugely benefitted by the light of perspective your opinions and feedback provides to them. The anonymity of the reviewer in the 360-degree feedback process guarantees that a respondent has the freedom to speak their mind. It is a good idea to use this privilege to be incisive and precisely point out the strengths and weaknesses of the recipient of the feedback. Core competencies, weaknesses, and hidden strengths can all be teased out and noted accordingly through a series of basic questions to oneself about these matters, answered honestly – without any shade of bias. 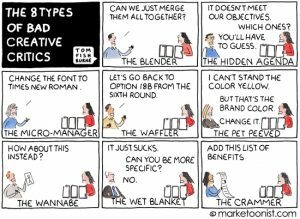 While it might be tempting to provide feedback by placing oneself in the other’s (in this case one’s manager or boss’) shoes, don’t lose focus of your perspective. 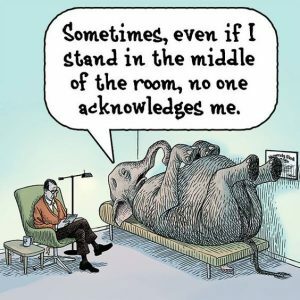 The 360-degree feedback system works because it gives value to the unique perspectives every respondent brings to their feedback. Also, presuming what someone else is faced with generally leads to the feedback that is counterproductive. You may be getting only a partial picture of how they work and may be completely oblivious of other demands that weigh down upon them. Use the knowledge that your position brings to provide feedback that can lead to tangible and sustainable progress. No one likes to engage in banal platitudes or abstractions. Providing specific, to-the-point feedback that also offers help in the way of suggestions or solutions is key to affecting actionable change. The more serious and specific the feedback, the easier it is for the recipient to process it and progress accordingly. How Not To Provide Criticism. Credit: Brand Camp by Tom Fishburn. Formulate feedback around a single maxim – fostering self-development. Whatever the nature of the feedback you’re delivering, it should always serve to encourage actions you’d like to see done more often, including opinions about the style of management and its impacts on the workplace. In an environment where the 360-degree feedback process is a continuous periodic activity (in which case, congratulations! ), positive feedback can be further used as encouragement to point out improvements on behavior one had earlier given constructive criticism on. State clearly what it is that you like or not, what changes you would like to see and what should remain the same. Explain why you’d like certain changes and how they would definitely help improve things for the better. Feedback can be acted upon more easily if those receiving it, especially busy bosses and executives, know exactly where their strengths and problems lie. Affirmative action on their part can then follow swiftly, setting an example in their own turn. Experts are of the opinion that an over reliance on the chain of command prevents leaders from hearing the unvarnished truth. Bosses are deprived of becoming better leaders if they have no access to regular feedback to back their performance with. They may be well on the way to a potential downward spiral – let the organization down, lose the faith of shareholders and investors and face in front of employees – all because they had no idea about how their work ethic, behavior, and decisions were perceived by those around them. The 360-degree feedback process is thus an extremely important and serious affair for the effective development of an organization and its leaders along with the rest of its constituent figures. One of the necessary requirements towards crafting an effective 360-degree feedback system is asking the right questions. Asking the right questions involves knowing who the questions are meant for and what to do with the answers you receive. Make no mistake, the questions asked and the way their answers are organized make all the difference between accessible feedback that is actionable and feedback that is dull and devoid of useful content. These questions and queries are primarily modeled around qualities directly related to workplace competency, skills, and behavior. Providing feedback is optimally effective only when questions are framed that carefully guide and fully utilize the mutually beneficial space for communication and understanding that the 360-degree feedback process provides. Individual questions and queries can be crafted according to not only the needs of the person being reviewed but also depending upon the professional relationships the respondent has with the recipient. The responses may be connected to any of the various rating scales to bring together both qualitative and quantitative modes of assessment, as opposed to a strictly objective approach. Organizing and delivering feedback through the 360-degree feedback process may seem long and cumbersome to some but the human and organizational benefits received from the process far outweigh any other concerns. Done well, the collected feedback can prove to be instrumental in promoting effective change and development across levels in an organizational structure. Feedback cannot work unless it is made essential to company culture and carried out under a hygienic work ethic. Credit: Dilbert by Scott AdamsThe effective benefits of 360-degree feedback are realized only when you decide on which aspects of an employee’s workplace behavior and skills the feedback should concentrate on. 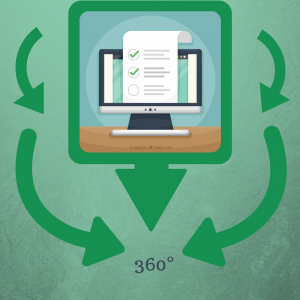 The core structure of a 360-degree review can be easily adapted as required to the specific situation and organization it is being used in. These are all individuals with a considerable amount of influence on the state and progress of an organization. They interact with and affect employees and company policies in many ways. Essentially it becomes important to gather information on and assess the overall impact of their leadership and policies and how they are perceived by those working in (and sometimes with) the organization. Each individual case here will have its own set of customized questions, queries, and respondents. A CEO, for example, interacts a lot and their work affects everyone within the organization. So, say their immediate colleagues, shareholders, some external stakeholders or even any particular employees from the company, as and how required. Feedback may be about broad overarching issues like governance, aligning vision and purpose, financial acumen and business outlook, technical and functional skills, accountability, problem-solving, engaging and responding to stakeholders or thought leadership – as the requirement might be. 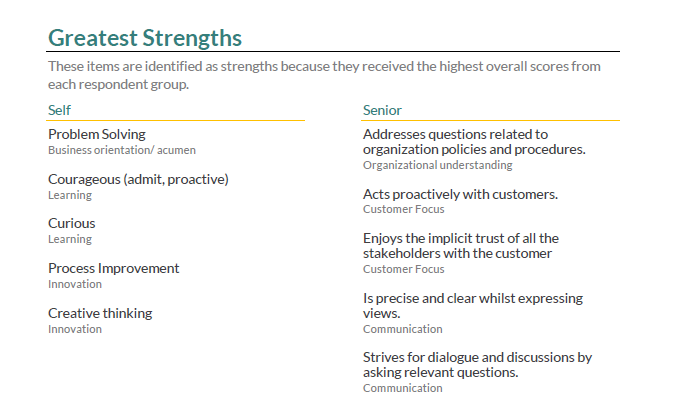 Collecting feedback for senior management may be undertaken by concentrating on say three or more areas of strength and weakness. The same 360-degree feedback questionnaire may not end up being given to every respondent. Reportees, immediate peers, board members, etc. – all of them answer questions strictly pertaining to their respective professional relationships to the person receiving feedback. In both cases, a rating scale might be combined with subjective comments to make the feedback more reflective and nuanced. The anonymous feedback enables them to see how their work and leadership is perceived in ways difficult to glean from other modes of feedback or review. They are exposed to how much of their vision translates into their work and the extent to which others believe in it. The perspectives of those they are leading reinforce their work with greater inclusivity. The transparency of having 360-degree reviews that can include both employees and the highest level of management in its results to further consolidation and unity within the organization. The benefits of this go way beyond simple development and cross over into increased confidence, communication, awareness of hidden strengths and blind spots, increased accountability and all-around in productivity in a holistic company culture. The 360-degree process in these cases can be used for a reason as diverse as rooting out and working on weaknesses to succession planning in major managerial positions. The process lends itself to similar use in the case of feedback for mid-level managers. Another scenario would be a 360-degree feedback process customized for teammates in a young, relatively smaller organizations. Performance appraisals apart, such organizations find much use for the 360-degree feedback system as a developmental tool. The process is set up in similar ways here but the implementation is less rigorous and in more of an informal setting. This leads to freer ways of giving and receiving feedback where everyone involved passionately share the same vision and benefit together from the process. In fact, sometimes employees even select the co-workers who’ll provide feedback for them! Behavior and criteria like professionalism, openness, self-management, interpersonal work-style, responsiveness to others, etc. are areas that questions and queries are broadly based on. Again these are also accompanied by subjective questions about a few things an employee or partner should start doing, stop doing, what they’re doing right, how they can do some things better, etc. The ratings and answers gleaned from all these responses can then be used by an efficiently automated 360-degree feedback system to create the feedback report that an individual receives and hopefully can understand and benefit from. The broadest scenario is, of course, implementing a 360-degree feedback process for employees with well-rounded, anonymous feedback gathered from their peers, reportees, managers along with internal and external stakeholders. 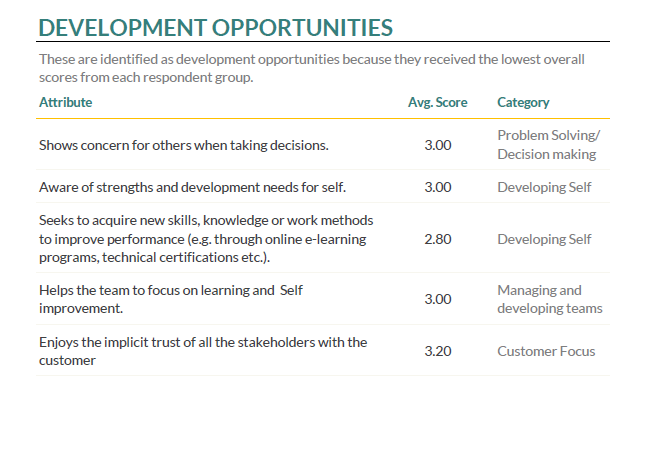 Here the feedback forms feature queries on a combination of general competencies and specific role related skills. Representatives from each of their work-related spheres ideally provide feedback for an individual. This involves a heterogeneous rater pool again including peers, reportees, managers along with other internal and external stakeholders that an employee might have professionally engaged with. 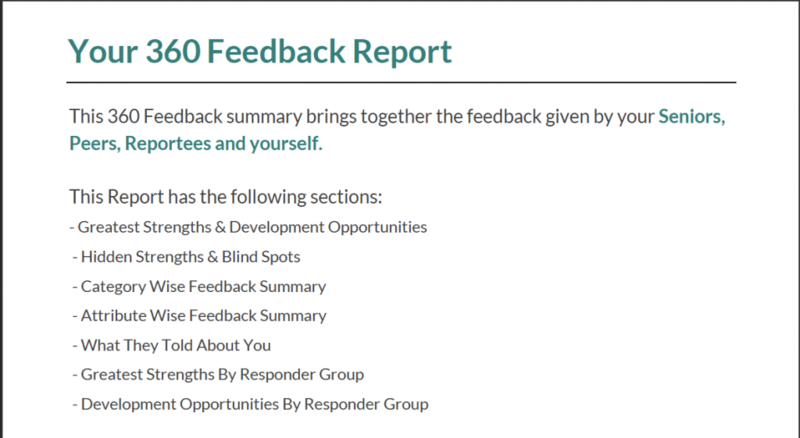 The feedback report thus prepared is an actionable list of activities, trends, perceptions, and suggestions for an individual to empirically work on and improve themselves, setting better goals, uncovering hidden strengths and competencies – thus preventing burnout, leading to organic growth and a wholesome sense of development in an organization. The form is the most important aspect to getting a 360-degree feedback right. Any 360-degree feedback process, no matter how sophisticated and nuanced fails in its duty if not supported and structured in a simple and easily navigable feedback form. At the crux of any feedback system is human endeavor and participation. 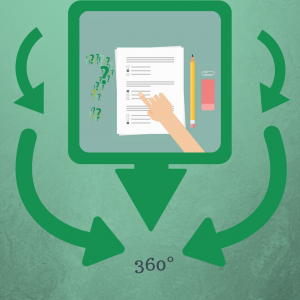 A 360-degree feedback form should thus have a clear tone and clean layout – one that encourages participating respondents to readily give constructive feedback. This includes skills or work behavior that their colleague is good at or areas they need improvement in. Questions and the number of elements per key skill or capability are customizable and ultimately dependent on the culture and vision of an organization. The columns and rows of questions and their responses can be easily set according to these parameters. Above and beyond that, however, it is the layout of the feedback form that matters the most. It is non-negotiable that it be easy on the eyes and for use. Efficient collection of feedback is dependent on good communication and articulation. This is possible only when a respondent finds a feedback form that is interactive, navigable, and not a waste of their time. The design of the feedback document should reflect the nature of the goals and company philosophy behind the undertaking of the whole 360-degree feedback process by an organization. The questionnaire should be built by careful consideration of a position’s key skill areas followed by breaking these down into individual elements. Each of these can then be measured via carefully worded questions or queries (which should be as descriptive as required), which the respondents answer, thus grading skills and behavior and providing feedback for the person in question. In a diverse enough group of participants, one might decide to have different questionnaires for different categories of respondents. 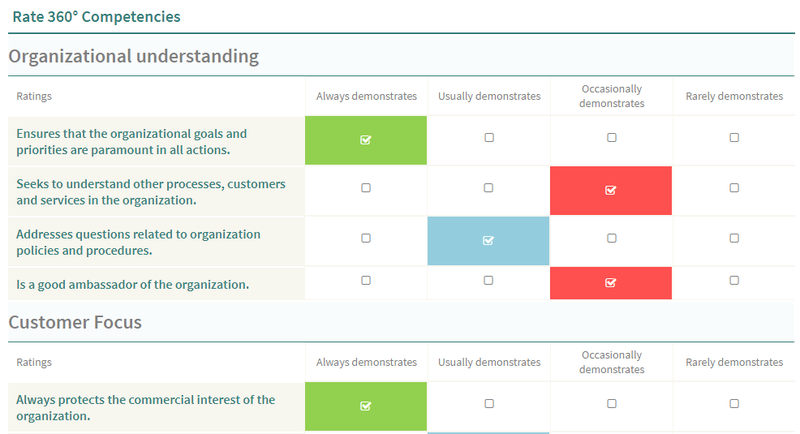 Questionnaires also vary depending on the competencies you choose to collect feedback on. Now to get to the flip side of the feedback process that also involves the 360-degree feedback process: providing feedback. Balance constructive feedback with positive feedback. Stick to the facts and try to remain objective. Be direct – get to the point. There’s no use beating around the bush. Everyone’s time is precious, including your own. Avoid generalizations and accusations as they usually tend to be counterproductive. Avoid focussing on someone’s personality or your own feelings towards them in your feedback. Underlying all of these procedures, suggestions, and concerns is the issue of anonymity. 360-degree feedback needs to be built on a strong bedrock of trust and honesty to be successful and beneficial. This is achievable only when the process is compatible with anonymous feedback, where respondents are assured of their anonymity and give constructive feedback as seniors, peers, or reportees without worrying about being identified. An effective feedback form is the mark of a streamlined, well-planned 360-degree feedback process propped in place by an equally efficient automated 360 feedback system. Proper implementation along the above lines is the key for organizations and the individuals in it to make the best of the feedback they receive and boldly meet their respective futures. An extract from a sample 360 feedback form is shown below. For a full view of the sample form, click here. 360 Degree Sample Reporting, Sir! 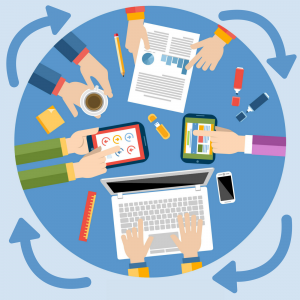 Reports can make or break a 360 Degree Feedback process. Credit: Dilbert by Scott Adams. A 360-degree feedback project on any level gathers a lot of data that has to be analyzed and translated into lucid terms in the form of a report. The final report delivered to a working individual is the most important part of getting the best out of the 360-degree feedback process. These must be particularly designed to showcase clarity, focus, and ease of comprehension. If a feedback report is not loud and clear about the facts it wants to convey to the recipient then it does not amount as actionable feedback. In such a case the whole process might as well have been a failure. A large amount of information gathered about the personnel in an organization and how they work together are mined by the report so that it can be used to develop management action plans. 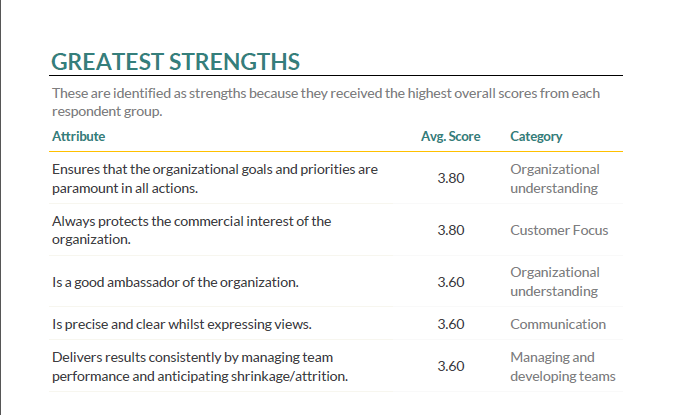 The ideal report is a really good summary of all the feedback that one has received. Then again the nuances of the details might get lost in a summary. They must be a careful combination of the two. This is why a detailed spreadsheet report, generated immediately after completion of the process doesn’t really amount to helping an employee understand much, as interesting it might be to a program administrator. The respondents in a 360-degree feedback process are kept anonymous, identifiable only to the initiators (like CEOs or Human Resource departments) of the feedback process. It is also them who filter out comments or information that does not constitute constructive feedback. The ideal automated 360-degree feedback system should generate a graphical, visually striking report that conveys all the major facts, perceptions and actionable advice that an individual needs take away from the whole process. All of this without burdening the recipient with too much information. On the other hand, graphs, infographics, meaningful illustrations or visual representations of gathered data through analytical tools like the Johari window are a great way of instantly getting points across. It’s so much easier to process information visually. Feedback results can be presented as raw scores, through different rating types (calculated on the basis of the number of raters or the total number ratings, as the case may be) or standardized scores combined with or show separate from subjective comments gleaned from answers to open-ended questions in the feedback form. It should start with an overview. Easy to understand at a glance. Here‘s a sample. This includes a graphical and numerical overview of competencies along with comparisons of self-perception and others’ opinions. Competencies are broken down here and explained in greater detail. May be accompanied by self-score, average feedback score, and individual feedback responses to each question. A collection of subjective comments made in answer to questions or queries presented in random order to preserve anonymity. This would include factors like greatest strengths, blind spots, areas of improvement, hidden strengths, or any other analytical results that can be gleaned from all the feedback. Development opportunities and suggestions in general sorted by rater groups. This may also be accompanied by an overall assessment as a conclusion. A recipient must absolutely feel the essence of what their peers and colleagues are trying to convey to them and not lose track of the message by attempting to read too complex or misleading analyses. A simple (yet customizable) automated system is necessary in order to get the most out of a time-bound process like 360-degree feedback. This is how you get actionable feedback that easily communicates a smart and efficient overview of their workplace behavior and skills to the recipient – instantly setting them on their ways to meaningful improvement and course correction in their day-to-day work goals and activities. 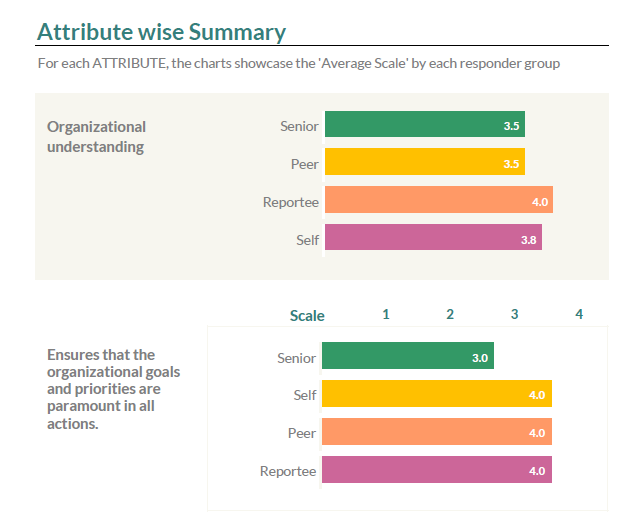 How Organizations have Changed their Performance Reviews? Pingback: How to Setup 360 Degree Feedback? Pingback: How Organizations have Changed their Performance Reviews? Pingback: How to Setup 360° Feedback? What is the Future of Performance Management? Workplace Automation: How AI Affects Employee Performance? GroSum is an online performance management suite offering tools for appraisals, 360 feedback, ongoing feedback, checkins, compensation and analytics. GroSum helps our clients' employees to be happy, engaged and performing.